GOLETA, Calif., Oct. 3, 2018 /PRNewswire/ -- Teva® (a division of Deckers Brands, NYSE: DECK) announced a partnership today with breakout music sweethearts, Chloe x Halle. Coined, "Worn by Chloe x Halle," the namesake footwear collection launches with a list of go-to styles hand-selected by the newest starlets. Kicking off the partnership, the singing and acting sensations handpicked styles to curate a rocker-chic inspired offering taken from the current Fall collection. Echoing Chloe x Halle's eclectic stage-worthy style, their favorite footwear picks underscore the bold hues and utilitarian silhouettes that have become synonymous with the outdoor heritage brand. Recently seen on the catwalks of NYFW, the brand ambassadors' picks deliver a blend of on-trend sandals and shoes tailored for fashion's greatest adventurers. "Fearless female artists have always inspired and encouraged us to trust our intuition. As artists who thrive on creativity and individuality, we're thrilled to be joining the Teva family," said Chloe x Halle. "Our top picks are a personal expression of freedom, not just in footwear, but in our everyday identity." Original Universal Sandal - From rivers and trails to stoops and sidewalks around the world, one of Teva's very first sandals stands as a testament to timeless comfort and utilitarian style. Indio Jewell – Ready to hang from casual days to wild nights, this sporty platform is built on the bones of a classic water sandal, featuring a breezy mesh upper with a cool, head-turning design and walk anywhere comfort. Indio Whip – A classic from Teva's archives updated for the now, this chic sandal features interesting crossover straps and an elevated outsole for a stylish platform boost. Ember Moc – Part sneaker and part sleeping bag, this supremely chill slip-on handles everything from campsites to long flights with ease, featuring a laidback collapsible heel and soft, slipper-like comfort. 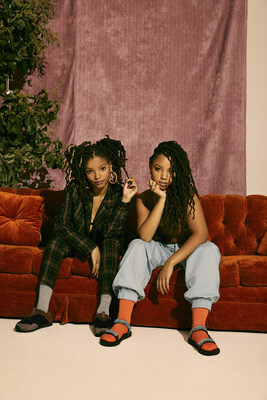 "Chloe x Halle's distinctive personal style is reflected in their top picks from our Fall collection," said Erika Gabrielli, Sr. Marketing Director at Teva. "We love that their music and acting embodies a creative spirit of self-expression. The duo personifies the curiosity that exists at the core of Teva, and their must-have styles are a true representation of the freedom to wander." The "Worn by Chloe x Halle" looks start at $50 and are available at Teva.com/chloexhalle. The partnership campaign was shot by photographer Taylor Rainbolt and styled by Zerina Akers with makeup by Christiana Cassell and hair by Tinisha Meeks.